Black sea bass comprise a domestic fishery in the US and are not typically exported. Landings of black sea bass in the mid-Atlantic peaked in 1952 with 9,883 tons, before declining to only 566 tons in 1971. Since then, landings have stabilized around 1400 tons annually. Commercial landings of the southeastern stock peaked in the 1990’s and have since declined. Recreational landings of both stocks represent a significant portion of fishing mortality. In the latest stock assessment, the northern stock was found to be healthy, although there are uncertainties regarding the data. The southern stock is currently rebuilding, although it is thought that fishing pressure is too high. The black sea bass stock is managed by the mid-Atlantic Fishery Management Council and Atlantic States Marine Fisheries Commission. Management is considered to be effective, as stock levels have been maintained at a healthy level. The southern stock is moderately well-managed, and a recovery plan is in place for the rebuilding of the stock by 2016. The use of pots and traps has minimal effect on other species as they are a selective method of fishing. Pots and traps cause moderate damage to the habitat since they are in contact with the seafloor and have the potential to damage sensitive coral. 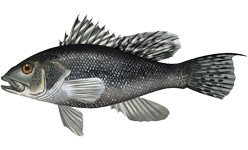 The black sea bass stock is managed by the mid-Atlantic Fishery Management Council and Atlantic States Marine Fisheries Commission. Management is considered to be effective, as stock levels have been maintained at a healthy level. The southern stock is moderately well-managed, and a recovery plan is in place for the rebuilding of the stock by 2016. Handlines are generally a selective method of fishing, and little bycatch is caught in the Mid-Atlantic fishery. Some bycatch is caught in the South-Atlantic fishery such as vermilion snapper, red porgy, and groupers. However, the quantities of the bycatch species caught are likely too low to affect their populations. Handlines have little to no impacts on the habitat. Additionally managers are working towards an ecosystem based management program. Otter trawls are a non-selective fishing method, and other species such as Atlantic flatfish are often incidentally caught with the black sea bass, and retained. Of concern is the bycatch of endangered loggerhead sea turtles. Otter trawls are highly damaging to the habitat. Effects include sediment resuspension, destruction of corals, and other physical structures, and injury and mortality of organisms.